The NEW jane iredale limited edition Smoke & Mirrors Eye Kit has everything you need to create soft day-wear looks for work and sultry evening eyes for play. 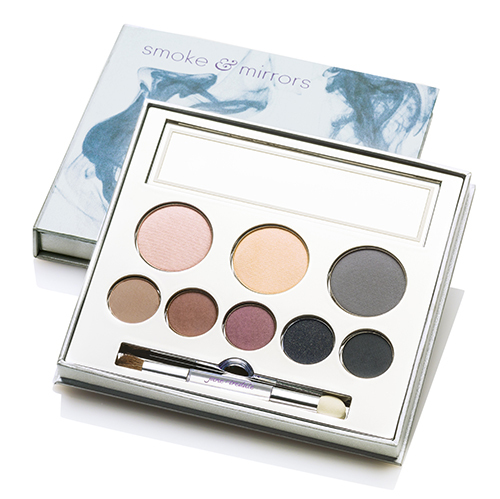 And if the thought of creating a smoky eye intimidates you, breathe easy; each kit comes with a “how-to” guide to create your favorite smoky eye looks, from basic to sophisticated. Eight versatile shades are packaged in an artful travel box with a mirror, dual-ended application brush and pull-out application guide. Great for travel, or to stash in your handbag for easy on-the-go, day-to-night transitions. SMOKIN’ HOT GIFT WITH ONLINE PURCHASEEnter code NIGHTANDDAY at check-out and receive a FREE deluxe travel size PureLash Extender & Conditioner, FREE deluxe travel size Longest Lash Black Ice Mascara and FREE shipping – a $20.50 value!